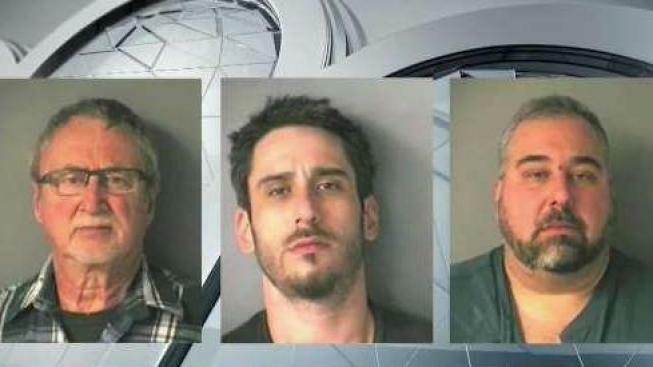 Two New Hampshire brothers and their father were arrested Monday after the siblings were allegedly involved in a brawl. Police in Merrimack responded to a call at about 3 p.m. of an assault that just occurred at a home. At the scene, they determined that 35-year-old Robert Trepanier and 44-year-old Jason Trepanier were involved in a fight that led to physical violence. Officials determined the two brothers were arguing when Robert Trepanier allegedly cut Jason Trepanier in the hand with a putty knife. In response, Jason Trepanier struck his brother in the head, according to police. During the investigation, 71-year-old Marcel Trepanier allegedly became belligerent with an officer and pulled them towards him. Police said when they attempted to make an arrest, the father resisted and pulled his arms away. All the involved parties were charged with simple assault and released on personal recognizance bail. Marcel Trepanier was also charged resisting arrest. The brothers are expected to appear at the Ninth Circuit Court, Merrimack Division on Tuesday. Marcel Trepanier is scheduled to appear at the court on Dec. 27. It is unclear if any member of the Trepanier family has an attorney.